Paulette Phillips makes poetic and uncanny videos that use voyeurism and narrated observation to reveal psycho-socio aspects of human relations. Phillips references avant-garde, modernist and post-modern strategies of constructing meaning. Filmed off the coast of Nova Scotia, The Floating House (2002) is a meditation on memory, loss, and anxiety. Inspired by Phillips’ research about a murder of a woman forty years ago, the video oscillates between the real and the simulated, seducing us into a suspension of disbelief. Paulette Phillips has worked in both video and photography since the early 1980s. In the majority of her works, entirely fictional dramas unfold through the lens of her camera. In these narratives, she employs a range of cinematographic tools usually found in mainstream cinema – slow zooms, first-person points of view, climactic soundtracks, etc. – to heighten the dramatic content of her works. Phillips’ pieces speak of individuals caught up in intricate life situations. Often adopting a firstperson point of view, her camera transforms viewers from the position of passively witnessing to actively participating in bizarre situations. 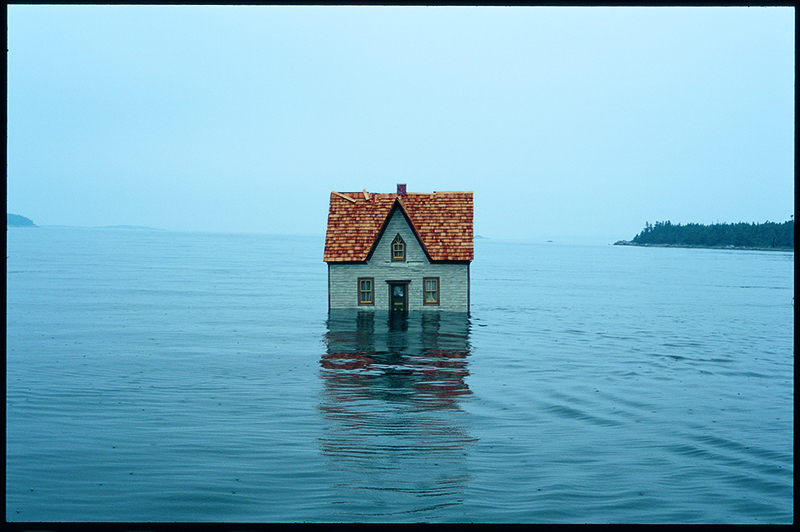 In The Floating House (2002), scenes of a house floating on the Atlantic Ocean alternate between images and sounds that allude to a catastrophic domestic trauma. The home – carefully constructed to represent a metaphor for physical, social and emotional levels of human interaction – is destroyed by forces seemingly greater than its constituents, namely, the ocean and the momentum of a domestic turmoil. With her 2004 work Crosstalk, Phillips focuses her camera on a single person attempting to confront a whole city by bravely standing in the way of a city bus during rush hour. While the traffic initially crawls to a stop, this lone individual knows that it is only a matter of time before the city reasserts its dominant position. To save face, she ultimately decides to attempt directing the traffic, rather than trying to stop it. Since she lacks the requisite authority (or even a uniform representing it), the city simply goes about its daily business. As in The Floating House narrative, the individual will is set against an imposing backdrop that ultimately engulfs it. Paulette Phillips, The Floating House, 2002. Video still from the 16mm film transferred to DVD, colour, 5.1 surround sound, projection dimensions variable. Courtesy of the artist.